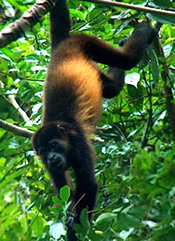 The mantled howler monkey is found in southern Mexico and Central and South America. It is named for its fringe of long, golden-brown hair along the sides, called a "mantle." It also gets its name from the roaring howl that it makes when communicating or alerting others of a disturbance. Adults are very large and stocky with black fur. Most individuals have long, yellow or brown fur saddles. The average weight of an adult is around 12 to 13 lbs, and males are larger than females. This species can be found in lowland and montane rainforests at altitudes as high as 2000 meters. They prefer to remain in the trees since they do not move well on the ground. They are often seen walking or climbing through the trees or suspending themselves below branches, hanging by their arms or tails while feeding. Diet consist of fruit, leaves, and flowers. They are very social and live in groups of 10 to 20 individuals with one alpha male. Breeding occurs throughout the year, and females give birth to one young after a gestation period of six months. This species is threatened by habitat destruction, rainforest fragmentation and natural disasters. 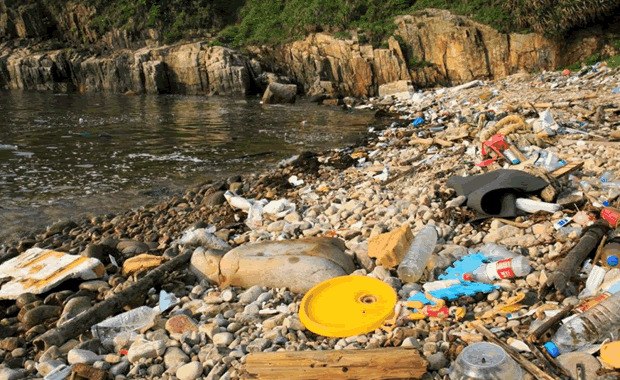 It is legally protected, and about 1300 individuals can be found in protected areas. Copyright Notice: This article is licensed under the GNU Free Documentation License. It uses material from the Wikipedia article "Mantled howler". Glenn, C. R. 2006. "Earth's Endangered Creatures - Mantled Howler Monkey Facts" (Online). Accessed 4/22/2019 at http://earthsendangered.com/profile.asp?sp=276&ID=9. Need more Mantled Howler Monkey facts?